Anyone remember that game on the PlayStation by Namco that was excellent? 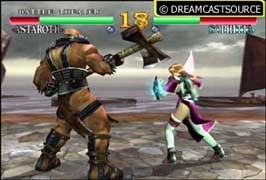 It was a cut above Tekken, but never gained the same amount of status as the monster that is Tekken. Remember? Soul Blade. Does that ring a bell? Well, Namco deemed the title fit for a sequel. And what better console to bring what could be its masterpiece to, than the Dreamcast! Lets start with the thing that will amaze you to start off with. This is a graphically impressive game. The engine is solid, and creates a stunning world in which some breath-takingly beautiful characters can fight to the virtual death (or knock out, whatever�). The game looks realistic in style, yet at the same time does not look so realistic. A contradiction, yes. However, it is a true statement. If you look at the screens, you will see what I am talking about. The style fits the game to a tee, and the detail makes Soul Calibur that bit more special. Bits of clothing move as your character is waving his/her weapon about, or being thrown to the other side of the arena. Hair also moves, which adds to the realism. 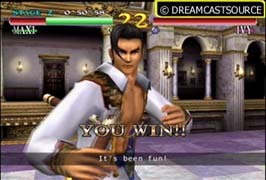 The characters also move super-realistically, due to the state-of-the-art motion capture techniques that Namco utilised. Every character looks amazing � yet they do not look completely realistic, which is good. The style of the game is such that complete realism would spoil it. The backgrounds/arenas in the game are also amazingly detailed, with leaves blowing around, rats crawling everywhere (not in every stage�) and lavish effects and detail. Enough about the graphics. Lets go on to what compliments those luscious graphics� sound! Every good game needs great sound to compliment it. 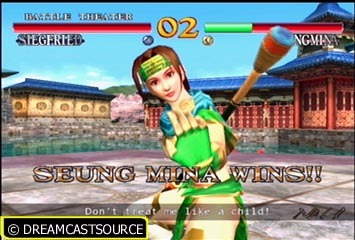 And Soul Calibur can proudly raise its head high and say, �I HAVE GOOD SOUND EFFECTS AND MUSIC!! !� The sound effects on this game are brilliant. Each characters weapon has its own set of sound effects, making each sound different from all the others. Each character also has his/her own voices and such, which really add to the games atmosphere. All the characters speak in Japanese, but there are subtitles to translate the characters winning speeches. The screams and war cries of the characters are extremely satisfying to hear as you pull off that impossible move, fly across the stage or simply stab your opponent in the stomach. The music is great too. It is just right for a beat �em up � fast paced, banging and wicked (in both senses of the word)! Wow! This game has gameplay coming out of its ears! Fight with the computer, with a friend, go through a series of seemingly endless missions, practice, try and beat your time in Time Attack, try and survive for the longest in Survival mode� the list goes on and on! Fighting is a breeze with the control system Namco have implemented, but it is not too easy to master so as to take the fun out of the game. There is A LOT to be mastered in this game, and all the special moves that can be pulled off will have to be learned. Lifespan is also something that Soul Calibur succeeds in. 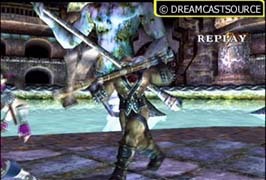 This game will last you a VERY long time, considering that there are well over 50 missions to beat (many are simply variations or harder versions of a mission � but this does not matter as challenge is always welcome in the world of Soul Calibur! ), many, many characters to get, as well as around 20 stages, hundreds of pieces of artwork to buy (you get points for completing missions and for defeating other game modes), new modes of play and some interesting features like Exhibition Mode (watch all the characters show off! 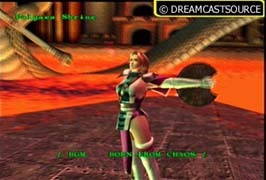 ), Battle Theatre (watch two characters battle it out), Opening Direction (you can control who will appear in the opening credits!) and Character Profiles (lets you take a closer look at your favourite characters). Basically, there is so much here to keep you interested, that you will probably never want to leave your DC again! As sad as it may sound, I have watched the Exhibition Mode many times, as it is an impressive sight. You can even control the camera during this mode, and you can do the same with Battle Theatre and some others. I cannot stress enough how much fun this game is and how completely addictive it is! To quote a favourite character of mine (of cartoon fame, not game) � Soul Calibur is �fun on a bun� (that quote was from Bender from Futurama � in case you didn�t know)! 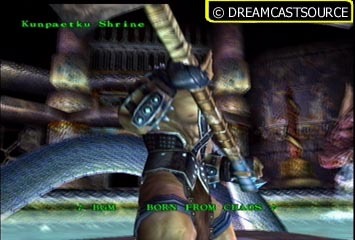 This has to be one of my favourite games, if not my absolute favourite game on the Dreamcast. It has style; quantity, quality and you feel immense satisfaction and joy from beating and unlocking areas of the game. I cannot recommend this game enough to all you fighting fans out there! So, instead, I will simply say this� SOUL CALIBUR IS THE GREATEST FIGHTING GAME THERE IS. FULL STOP! 10 Amazing detail and style. This game has some of the best visuals on the DC, and is definitely a benchmark game, one that developers worldwide will look up to. Sound 9.0 Convincing and original sound effects and music. Every smack, bang and wallop is satisfying to hear, and the music keeps the atmosphere and pace of the game running smoothly. Gameplay 9.5 Great controls and many different modes of play make this one of the most playable games ever. "The best game on the Dreamcast so far, no doubt. Unparalleled as a fighting game, untouchable as a DC great. More than worthy of your attention. In fact, you should be bowing down and worshipping this game for the god that it is!" F**k that was a long final verdict by Andy! That�s because a game of such high standard deserves such a verdict. I�ve tried hard to find flaws in this game, the only one, which isn�t really a flaw, is that it�s quite easy. Namco have squeezed so much onto this game. The visuals are absolutely stunning; PS2 owners are going to have to wait quite some time before they get something of this standard. I must point out that the texture colours are very vibrant yet still look realistic. The flares of light that weapons leave behind are awesome. There are hundreds of small options in the game that help it to be crowned �The greatest fighter on the planet�. Picking up on one of Andy�s points, where you can watch any 2 CPU opponents battle it out in the Battle theatre; you�re even given the option to rotate and zoom the camera around the players to get the best views of the action. You can even adjust the height of the camera; just brilliant! These little treats that Namco have embedded in the game just bring it to life. There�s a lot more than the bog standard �fight your way to the boss� mode found in all fighting games. This game will last ages, and if you have someone else to compete against then god has answered all your beat �em up needs! >>Check out the full set of 34 hi-res original screenshots! >>Download some exclusive Soul Calibur wallpapers! >>Buy this game or get more info! >>Compare prices for this game and get the best deal! >>Check out the full set of 34 hi-resolution original screenshots!